01-30-2019 - Springerville, AZ - Sipe White Mountain Wildlife Area- The elk or wapiti is one of the largest species within the deer family, Cervidae, in the world, and one of the largest terrestrial mammals in North America and Northeast Asia. What an amazing light to capture the herd in !!! Stunning wildlife image !! Wonderful to see so many of them, including the babies !! You certainly caught the feeling of the herd moving. Nice shot! 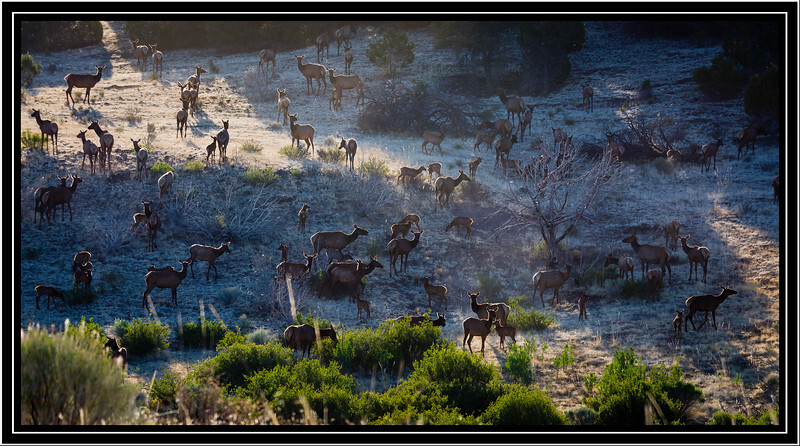 Superb shot of so many elk! Love the backlighting! Nice herd of elk--only place I've seen this many at once was in Rock Mtn Nat Park. Wow! What a plethora of elk...must have been thrilling to see this! Remarkable sight in the early morning light.